This Argonian has not appeared in the games before, and is presumably a character from the upcoming Return to Clockwork City story, so there's not much to say lorewise. This card will, naturally, be useful in Pilfer-based decks, especially with cards like Master of Thieves. If you're able to use it to pilfer twice in one turn, it can have devastating effect: two new creatures on the board in addition to the 10 damage caused. Equipping it with Quicksilver Crossbow or using Archer's Gambit also will work well with it, triggering the Pilfer effect by causing 1 damage to your opponent. It could also come in handy in Assassin or Scout decks when paired with Studious Greybeard or Scout's Report. Those cards let you see the top card of your deck and discard it if you want; this can help you cycle through your deck if you're looking for a specific creature. When the admins saw this card we had to laugh; Red Bramman is something of a running joke on the UESP. 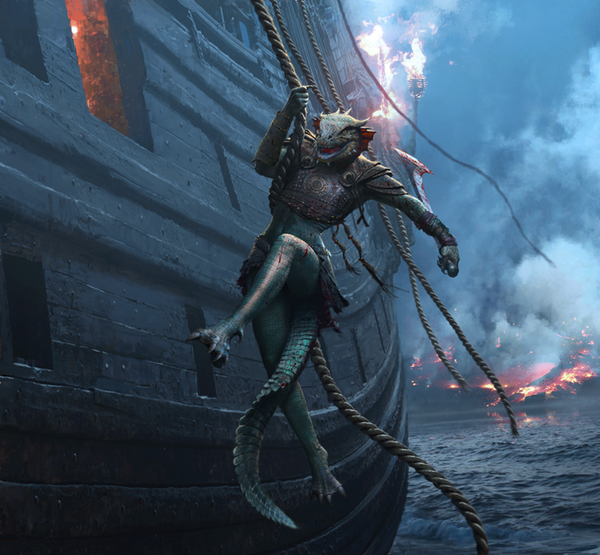 In lore, he was a human pirate named for his red hair, who attacked Black Marsh and soured human-Argonian relations for a while since he was many Argonians' first impression of man, so we were a bit surprised to see Bramman as an Argonian in Legends. 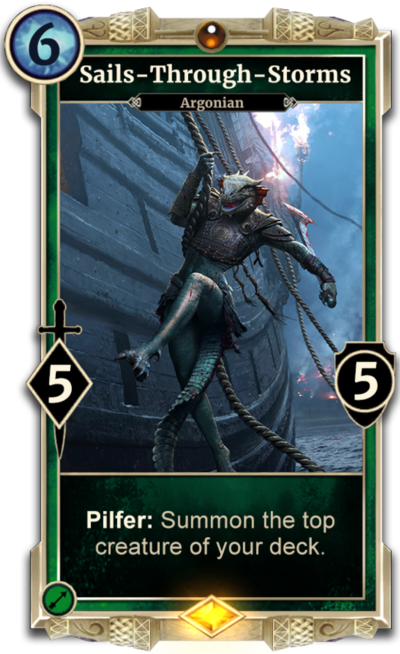 Considering how much we've mentioned it, we wouldn't be surprised if this Argonian pirate was chosen specifically for us, so if it was, well played; either way, we were entertained by it. The wiki page for the card can be found here. Be sure to check out the rest of our Legends pages for more information about the cards and game! Thank you to Dire Wolf Digital and Bethesda for the card, and to KriHavok and Ilaro for input about the card mechanics!